Here are the photos, and some insight in addition to the video review that was posted earlier. 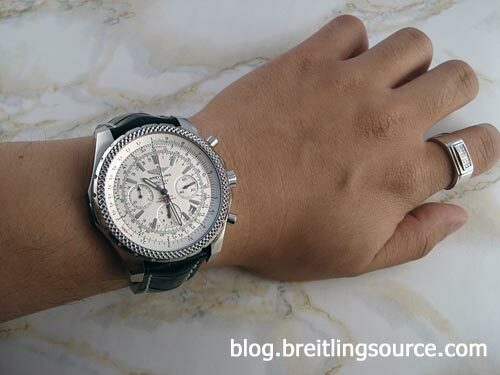 The Breitling for Bentley Motors is my favourite watch, and probably draws the most looks and remarks… some for its sheer size, and some for it’s beauty. With the distinctive Knurled Bezel that is a Bentley trademark, the watch does not go unnoticed, and the wide, shallow dial gives extremely easy reading with a bold statement in style. Applied stainless steel indexes and a gloss white dial, guilloche subdials all add to the elegance of the watch. The beautiful large applied wings logo looks fantastic in the 12 o’clock position, and inside beats a 30 second chronograph which is more accurate than your standard chronos. Subseconds are located at 3 o’clock. Slide rule bezel with inner gear system that allows the watch to be more water resistant white still using the inner bezel and without the inconvenience of using a crown to turn the inner bezel like the IWC Aquatimer and Sinn 903. The back of the watch is simple, with the model and some text engraved. Serial number and model numbers as well. 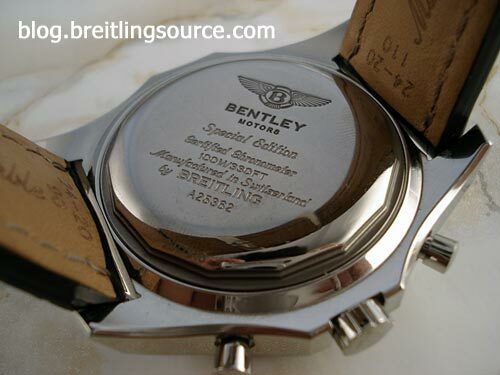 The Breitling Bentley 6.75 has a much nicer caseback, and I wish this one did too.. but oh well! But as you can see from the shot above, its all about wrist presence and class… and the Breitling for Bentley Motors has them both! This watch looks incredible on the wrist with it’s enourmous size yet maintains a level of class rarely associated with wrist clocks of this size such as the Breitling Super Avenger which tends to be less class, more bling/sporty. 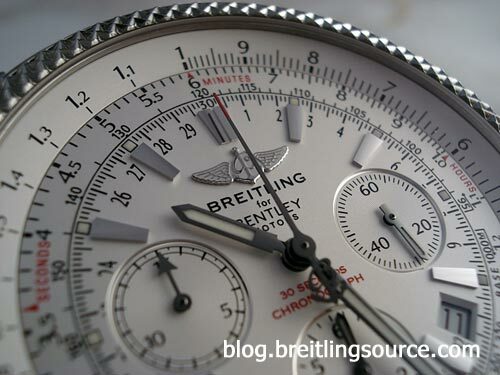 Hope you enjoyed the pictures and short review of the Breitling Bentley Motors watch! Adnan, actually it is a good comparison. You made a statement that claims there should be a correlation between scratch resistance and the price of the case material. My example of Gold was to indicate that there are other factors that determine the value of a watch – cost of the material is just one factor. If you really think Rados are the cat’s meow, by all means.. buy some more Rados. Samuel – reply to which? This is your first post..
Riz – its all personal preference. B logo on winder dial. Silver breitling logo with red spinning dial. Stainless steel. With a raised 5 spoke with a B in the middle. Hope u can help. Also if it is a fake what model was it suppose to be copying ? of course its a fake. we don’t do fakes here. try one of the fake sites. Hey can someone tell me if mine is fake or real? Hey did you read any of the posts before asking the exact same question? Fake. No I skimmed through it. Welp its fake, too bad it was free… One day I will own the real one!!! Wolf Designs winders are good. You should check with Wolf on the specs to make sure that it will wind your Motors T correctly, however. Chances are it will. how much does a watch go for if it has a cracked face? thank you. Probably the value minus whatever it costs to fix it minus a few hundred or so for the trouble. Looking to purchase a Bentley and cant decide between the supersports SS or GT-2 SS (just came out). I am leaning towards the supersports as its a limited edition although i am worried that the 49mm face is too large, the GT-2 has a 45mm face. Do the limited edition models hold their value better? Any suggestions on what to go with?? 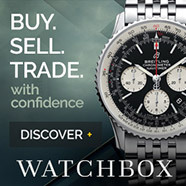 Hi Shazaib, I’m not interested but we’ll see if any of the other readers here feel like sending s few thousaound out to Pakistan to buy a Breitling for Bentley. 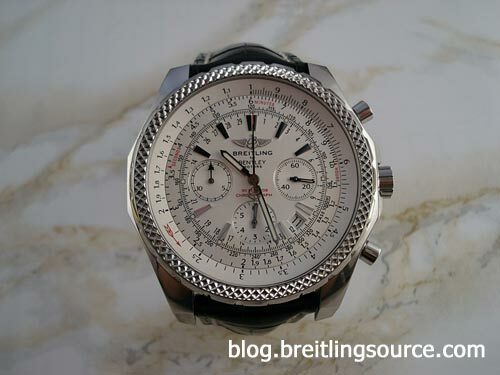 HI, my husband found Bentley Motors Breitling Watch.
. I’m trying to figure out if it’s real and what’s the worth of it? What do I need to look to know if it’s real? This watch was gifted from a weathly individual who probably didn’t know it was fake. Can you advise if it is fake?